Spinning wheels, crushing candies, popping bubbles – games are hard to resist and they make us feel good. That’s what makes gamified optins so powerful. How powerful? Gamified optins have been known to turn 2-3% conversions rates into conversions rates of 30% or more. Users Are in Charge: Interactive campaigns put the user in control, so they’re more motivated to engage and convert. They’re Motivated by a Sense of Achievement: Users play games to feel the sense of accomplishment that comes from winning. It’s Fun and Exciting! From a user’s point of view, spinning a wheel with the possibility of winning something is irresistible! 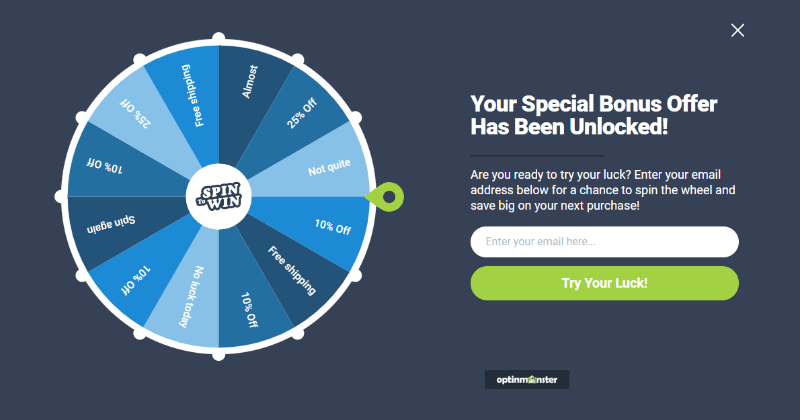 Our spin-to-win discount wheel is what happens when you cross the fun of a game show with the lead generating magic of an optin form. The wheel itself can be covered in custom prizes to be won: discounts, content upgrades, lead magnets, free shipping, or whatever else makes sense for your brand. The Coupon Wheel is a new element you can add to any Fullscreen campaign using OptinMonster’s easy drag-and-drop builder. We’ve also released 3 beautiful ready-to-use templates, professionally designed and totally customizable. The custom choices don’t stop at colors, though. You can Edit Wheel Selections to edit each piece of the wheel, right down to how easy or hard it is to win it! Set the display rules on your gamified campaign to appear after shoppers have visited 2 or more pages. This gives interested shoppers the chance to spin for a discount. Add exit-intent to your gamified campaign to show the optin when shoppers attempt to abandon the shopping cart page. Giving abandoning shoppers the chance to spin for a discount can make all the difference between losing and making the sale. Use your gamified optin to give users a way to win entries into your latest giveaway. If you’re struggling to get users to sign up for free trials or demos of your product or service, try having them work for it to see greater success. 😉 It goes back to the psychology of it and the sense of achievement that goes along with winning a free trial or demo. What will you do with this new optin? Create your gamified campaign today with an OptinMonster Growth Plan – click here to get started.